…this beautiful country. It’s not perfect, but it really is amazing. …the freedom to travel to places I never thought I’d see. …sisters who welcome you with open arms. 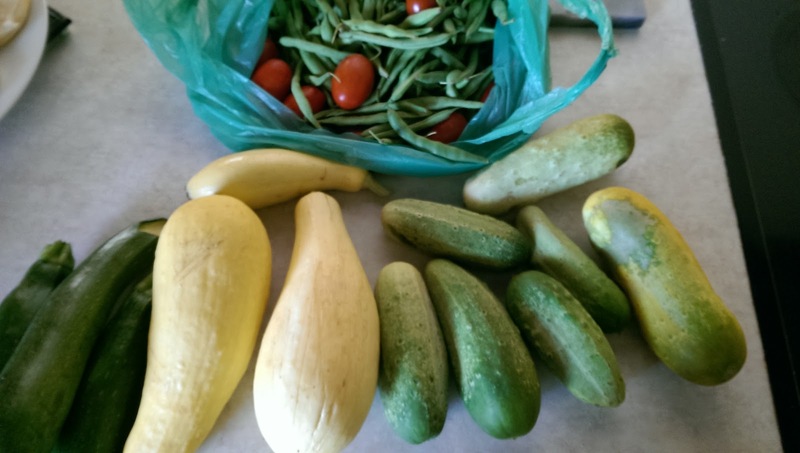 …sisters who can grow vegetables and are willing to share! …being able to spend time with my daddy during daily mass…and a daily rosary. Most days, anyway. Not today...I needed a "lazy day"! What little things are you thankful for this week? Love your list of things you are thankful for. Time with your dad is so precious and those veggies look delicious! Oh yum! You can never have too many cucumbers or zucchini! I know what you mean about time with your dad. My dad passed away in March and I miss him like crazy. I love seeing new places. There are so many places even in my own state that I haven't experienced and really want to see! We're growing some veggies for the first time and loving it! So far we haven't been able to use anything yet, but they're getting there! I honestly feel like I hit the lottery when people share their homemade yummies with me. That's the best! that is a good pic! So glad you had a good get-away, but are home and getting back into the groove! I love your thankfuls, Mary! Don't we have a beautiful country?? The landscape is so drastically different from one region to the next. I'm glad you are getting out and doing these things! Love your list! Sometimes I don't know quite what to do in life, but it always help to gain perspective to be thankful for the many good things.